That is the definition of an assault rifle according to Wikipedia. A well worded, concise answer to, what seems to be a simple question. However, this topic has a little more meat on its bones as you may have seen if you have opened a laptop, turned on a TV, or flipped through a paper over these past few months. All throughout the news and political sphere these days, the assault rifle is at the center of discussion. The recent string of mass shootings are bringing about a new found ground swell of gun reform speak, mainly directed towards this type of firearm, but even more specifically than assault rifles, much rhetoric is being thrown at the AR-15. After all, it was the main firearm used during the Aurora theater shooting, Sandy Hook massacre, and the terrorist attack in San Bernadino, so it’s understandable that the weapon has become synonymous with death and destruction in the national psyche. But this firearm, at the center of the re-ignited assault weapon ban debate, is not even an assault rifle. That’s right. There are several major differences between the AR-15 and what constitutes an assault rifle. Many people will say “It’s right there in the name! AR stands for assault rifle!” But it does not. The AR actually stands for Armalite rifle and 15 is the model number. Armalite being the company that created the AR-15. There are many misleading “facts” out right now in the nation’s gun debate, so to dispel some of the rumors and rhetoric, let’s take a look at some of the facts of the AR-15 and of assault rifles, so that we can see where the differences lie. The AR-15 is the civilian equivalent of the U.S. Army’s standard issue M4-A1 and both use the same 5.56mm rounds of ammunition, and look very similar to one another and admittedly, that does sound a little dangerous to the average person on the street. When someone hears the words military weapon and see a gun that can sometimes be the spitting image for one of the main weapons that the U.S. army uses, people may get a little nervous. But what the average person, who hasn’t done their studying, may not realize is that while the AR-15 can be considered related to an M4-A1, they are not the same. If they were, people would just sell M4-A1’s. In other words, assault rifles are battlefield rifles which can fire automatically. Many civilians have purchased semi-automatic-only rifles that look like military assault rifles. These civilian rifles are, unlike actual assault rifles, incapable of automatic fire. That is the major factor when looking at the difference between these two rifles. 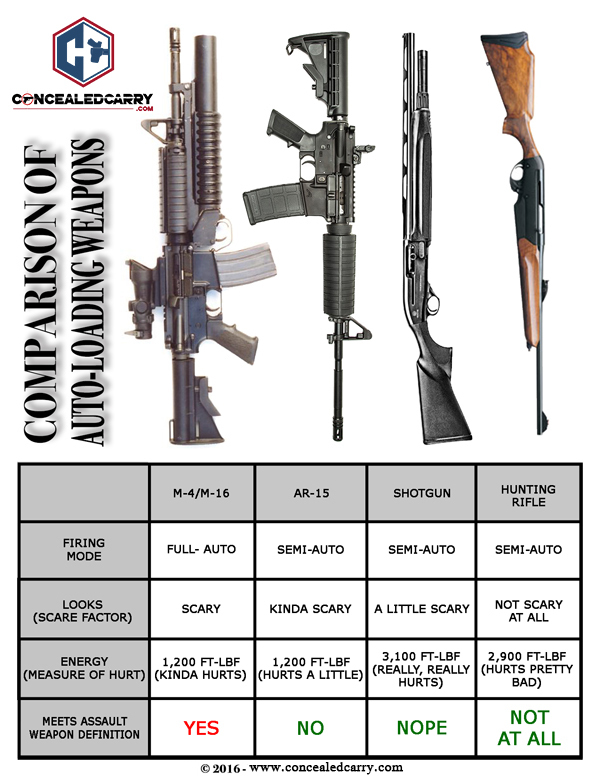 An assault rifle being a fully automated fire capable firearm vs. weapons like the AR-15, that while, by appearances look like they could fire fully automatic, can not. However, if you’re like me and want to do some fun reading about the schematics and really get into the nitty gritty of comparing the two firearms, AR15.com has a wonderful analysis showing the differences right here. Then Can We Just Ban All Semi-Automatic Rifles Like the AR? Understanding the difference between fully automatic guns and semi-automatic guns; you can more fully appreciate the challenge in trying to pass legislation to ban the AR-15 or similar rifles. You might be tempted to ask… “should we ban all semi-automatic rifles?” You can't do that either… unless you are suggesting that we should ban the most popular hunting rifles and shotguns. Now that is all well and good, and hopefully you have some material to take a look and see for yourself what constitutes an assault rifle, at least on a historical standpoint. However rarely is an issue like this going to be accepted as that easy to define and that’s where political debate comes in. Debate, by its definition should be about people coming to a consensus about an issue based on both sides bringing in facts and after a time coming to a decision about what the subject truly means. And with the subject of defining assault rifles, much debate rages, and has done so since 1994 when the federal ban on assault rifles was first brought to congress. 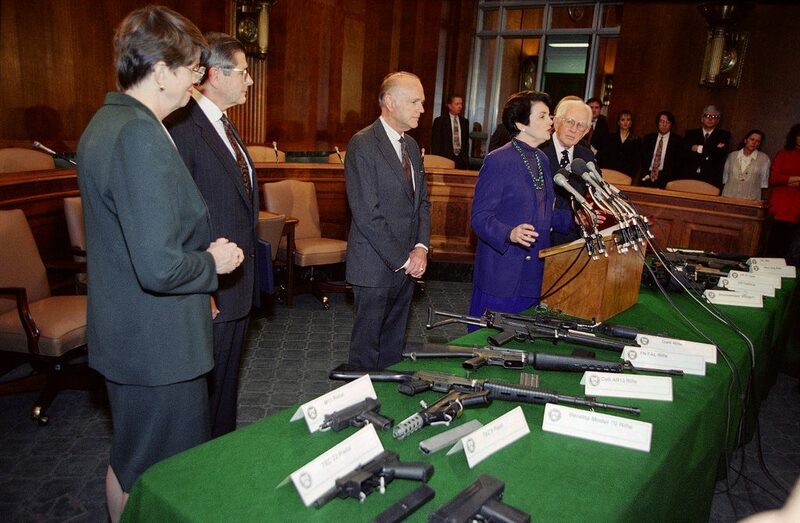 In 1994 a law was passed at the Federal Level most often referred to as the Assault Rifle Ban of 1994. The law outlawed a variety of guns, including rifles and high capacity magazines. It had a 10 year provision which set the law to expire in 2004 if there wasn't enough support to renew it. It died and wasn't renewed because there wasn't enough evidence to show that it had any affect at all on stopping crime. The Public Safety and Recreational Firearms Use Protection Act was a part of the Violent Crime Control and Law Enforcement Act of 1994. Its rules for defining what an “assault weapon” was were as follows. Now that language does appear to be quite blunt and plain, however, as you can see, these are all attachments. If there was a manufacturer at the time whose weapons did not adhere to these restrictions, what would you do? Close up shop? No. Of course not. You would adhere to the new laws and alter productions, and that is just what happens with newer models of the AR-15. You can take a look at the chart that I posted earlier from ar15.com and see that these can be modified on an M4-A1, but not on an AR. So after the manufacturers listened to the demands of congress, and the public saw that shootings were still going on, they needed a scapegoat, so they stuck the blame to the same companies and firearms, assumingly because it is what they knew. As public opinion shifted, further rulings were pushed to be implemented. Over time, the add-ons or modifications were debated and attempted to be further taken out of the equation. At one point President Obama even called into question all “military styled” weapons, without giving a greater indication as to what that means. Consider that the Columbine High School shooting was executed during this 10 year ban and the perpetrators used rifles that met the legal standard within the law. Despite being limited to 10 round magazines and certain makes of rifles being illegal; these students were able to bring a great amount of death and suffering to the school. And every time someone brings up a new amendment to the definition of an assault rifle, the debate essentially starts from scratch. Congress and the people trying to find out what exactly constitutes an assault rifle. Beyond the dictionary definition or even that which I posted at the beginning of this article, assault weapon is nothing more than a set of words. It has become painfully obvious that, even with a ban on specific firearms or specific modifications, these tragedies continue to occur. 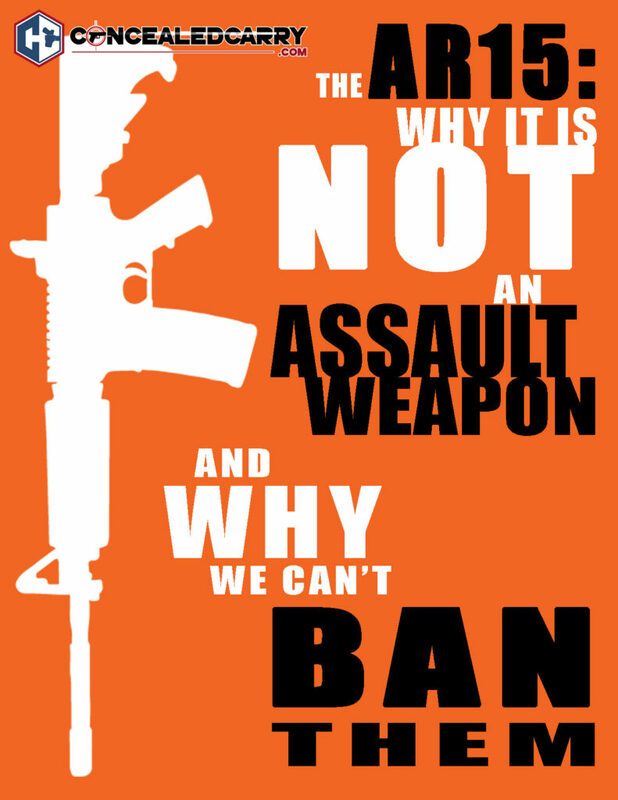 Maybe that’s because banning a single class of weapon isn’t an adequate solution to the problem of gun violence in this country, considering the very AR-15 that is, at many times, the center of this assault weapons debate, isn’t even the the type of firearm congress is attempting to ban. So what do we do? Is it mental health checks? Is it background checks? Does it go down deeper to attempt to fundamentally understand why each mass murderer or spree shooter does what they do? That very well may be a debate to come, but it apparently isn’t the one people are having today. We would encourage you to be a voice of reason. Share this article with others when you hear them talk about “military style weapons” that have no place in the hands of citizens. I HOPE THIS BRINGS UNDERSTANDING OF WHAT THE AR-15 RIFLE IS AND IS NOT. YOU GUYS DID A FANTASTIC JOB EDUCATING THOSE THAT DID NOT UNDERSTAND WHY EACH OF THE AR-15 AND M-4/M-16 ARE DIFFERENT AND WHY THE AR-15 IS LEGAL AND THE M-4/M-16 IS NOT LEGAL. THANKS FOR YOUR EFFORT IN THE ARTICLE. KEEP UP THE GOOD WORK YOU DO. The people who need to read this… won’t. They are much too busy making noise about dreamed up problems that don’t exist. Allen, I take exception with your use of the word “ignorant” which implies that the subject of your accusation has the ability to learn. Hello, liberal here. Skip, I’m reading this precisely because I believe it’s impossible to have a debate without understanding 1) the subject of the debate (can’t legislate about guns if you don’t know a semi-automatic from an automatic or that a “silencer”/suppressor doesn’t make a gunshot silent) and 2) the thinking of those on the other side. Not all liberals even have the same positions on gun control, in the same way that not all conservatives are identical. I know that some of the policies put forward by the left may be misguided and may not actually solve the problem. Others might. What matters is that the discussion is being had at all. Maybe if both sides worked together to figure out how we can reduce the frequency of these events (whether it be better background checks, stricter rules on who can own which guns, or a non-gun-related policy looking at increased security / mental health) we could actually make some progress. Allen & Jack: we’re all Americans regardless of what our political leanings are. If you dismiss every argument and person from the left as “loony,” “stupid,” or “ignorant,” you cast complex issues as black and white as if there is only one right answer and your side always has it. That’s objectively false. Until people on both sides stop insulting each other long enough to realize that both sides have good and bad points, make logical mistakes, ignore inconvenient facts, or fall victim to confirmation bias, we’re going to continue running in place as a nation while everyone moves past us. Maybe try to understand where we’re coming from every once in a while. THEY WILL NEVER TAKE MY WEAPONS UNLESS I’M FLAT ON GROUND-DEAD! One might think that perhaps , all students should be permitted to carry a weapon so they can protect them selves and fellow students who choose not to be armed . Our country is being turned into something far worse than a combat zone of one side being sent into combat with no weapons .The democraps, if given the chance will become our rulers instead of public servants . America Wake Up !! LOOK OUT !! Not to bring discredit to an otherwise well thought out and written explanation of what an assault rifle is, and I know this will bring confusion back into the mix for many reading this, it is NOT illegal to own an assault rifle capable of fully automatic operation. It is illegal in many states, but in many other states, (including my state of Wisconsin), if you can legally purchase a firearm, and you file the proper paperwork and pay the fees required, you can legally possess a fully automatic weapon. Hopefully this commentary doesn’t create cacophony of argumentative responses, but it is the truth and needs to be considered. Rich, thanks for adding that. We didn’t think a full dive into the NFA would help in the objective of this article. Fully auto weapons are illegal unless registered and taxed per the NFA; but as you said that isn’t a difficult or complicated process depending on your locality. The fact that a Class 111 license issued by ATF is the only way to legally own an assault weapon is why most folks will not go thru the paperwork, scrutiny, cost and/or the cost of the weapon which is triple what a fully loaded AR 15. I would like to have seen the rest of the story. Full auto or select fire weapons can be legally owned by anyone who can survive a government background check and history probe and can afford the cost of the item. Even low signature devices, silencers, are legal to own if you want to pay to have them. The problem I have with both of these items is the invasion of my home possibility that comes with both. License for either of these includes allowing ATF to inspect the safe storage at will. My trigger finger is plenty limber. I personally would like to see what is in the “small arms treaty” that Obama initiated and is still on the books to be ratified by the Senate. This treaty will be “active” at any time after it is ratified and there is NO turning back, the next president Can Not take it off the books. Playing devil’s advocate here. Consider posting argument to address these issues; aside from crime & self defense, the REAL reason we own guns is to protect us from the govt. itself. Sounds “terroristic”. You can shoot a semi as fast as you can pull the trigger. Pretty fast, so why even stipulate the difference? Why ammo restrictions? You can load 10 & you are legal but load 11 & Oh my God, you’re a criminal! We needsuccints arguing points to address these issues! This is a good source for information on what the states allow. Jacob, If your going to the state fair, lookup Oak Mountain Concessions. Soft serve ice cream and frozen bananas dipped in chocolate mmmm good. Tell Neil his brother Stan said hi. Really? Sort of ruins an otherwise well-written article. Rabbi, let me clarify my intent. While we generally refer to revolvers as being a different type of handgun than semi automatics; based purely on the the definition of semi-automatic (referring to the firing of 1 round per trigger press) all double action revolvers are semi-automatic handguns. In the context of this article, if a law were to ban firearms that fire 1 round per trigger press, double action revolvers would be included. “Many” or “most” works. “Every” doesn’t. Simple as that. Rabbi, fair points and thank you for helping us make our content better. I’ve edited the sentence in the article to “Most handguns sold today and a large majority of shotguns and other rifles also have semi-automatic firing systems” which I think addresses both issues. now in place have left our abilities to thwart treason and tyranny so far behind that our citizenry — even if it could work up enought gumption to attempt it — wouldn’t stand the chance of a snowball in hell of even surviving such a clash. What I mean is: Our federal govenment has already castrated the citizenry’s ability to defend itself against tyranny. All we have left is the VOTE. Don’t vote for Killary Clinton if you don’t want to experience this citizen bloodbath of monstrous proportions !!!!!!!!!! If you’ve ever been to a civil war (and I’ve been to several), you will know that all of that “arsenal” gets looted, divided, split and dispersed between the various factions before the sounds of the first shot fired reaches the horizon (Libya is a good example, as is Lebanon). Even during our own Civil War (or best termed, the “War Between the States”), one of the first actions taken was to confiscate and take control of the federal arsenals throughout the South (no Civil War battle was lost by the South due to lack of armaments, only a portion of which came through the blockade). The armed forces usually (especially in the U.S.A.) consist of elements with close ties to the various disaffected groups, and if called out of their barracks/bases, they quickly disappear after refusing to fire upon their kinsmen. Knowing this, a large percentage of the armed forces are kept “out” of the conflict by the central government until the dust settles (if it ever settles at all). All that aside, I certainly agree with your stance on defeating the Hildebeast. THANK YOU for the time and effort you put into this. 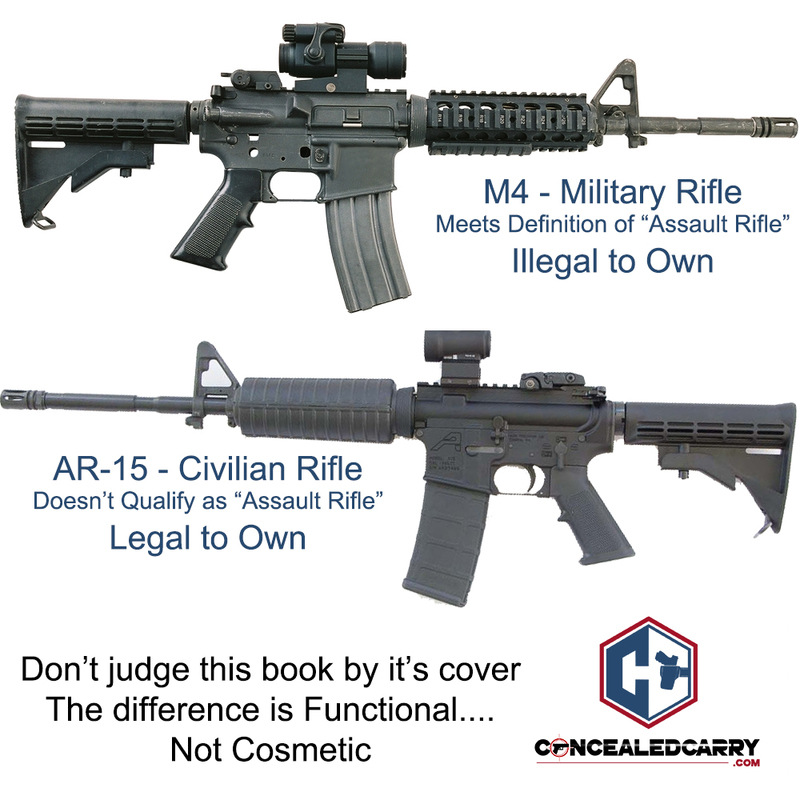 It is as clear as we need, although I might have added one extra photo of an AR laying next to a Mini 14 or something similar since it seems to be the black composite stock that flips everyone’s switch. Show them both and ask them to outlaw one. I love people’s answers. Of course, in this day and age, and especially the digital age, we are fighting a battle of information. People take sides, whether it’s left or right, black or white, any issue at all, and then seek out answers they already have. They only read information that supports their current position. If you are a Liberal, you have the ability to read nothing but liberal literature, which has become more and more specialized and now only presents one side of an issue. A liberal can read nothing but Liberal views and base every bit of information on the tired cliches thrown out by those rags. If they never read a view from the opposite side of an issue how can they have the knowledge and information to make a completely educated decision? It has become much too easy for each of us to live inside a bubble created by the wealth of specialized and targeted info on theInternet and on the shelf. It is our duty to seek out or at least entertain opposing views now. We must listen to each other as rational, logical arguments are presented. Instead, we live in a time governed by “That’s what I think and I don’t care what you believe”. That’s the most dangerous weapon on the face of the earth. Chuck… you are so right. It used to be that if you and I had differing opinions we could agree to disagree. Now if you have a differing opinion than mine, not only are you wrong; you’re dangerous; you’re a moron; I hate you; and you need to be removed from the equation. Somehow that needs to change before we can ever make progress to putting the pieces back together.